When you pull up to this almost empty strip mall in White Bear Lake, you would never think that it housed an excellent restaurant. 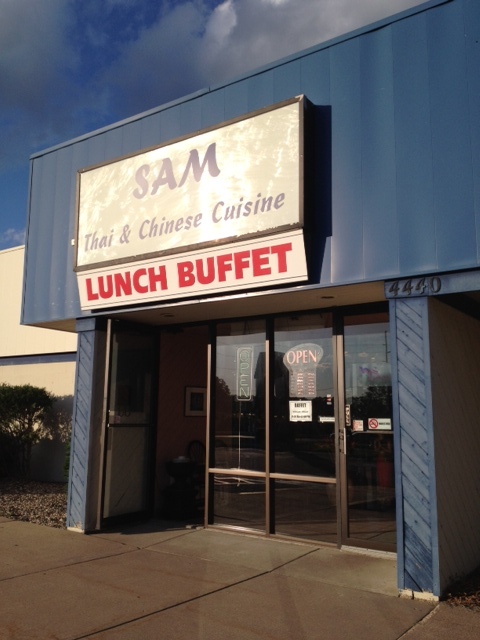 Usually known as the Thai place behind Kowalskis, Sam is the place to go to get Thai food in the North Suburbs. Just called Sam, plain and simple, this place has hands down the best Thai food I have ever had. Most likely my favorite because Sam who owns Sam, was born in Thailand and learned how to cook from his mother. She made everything from scratch. So, that is exactly how Sam does it as well. He makes all the sauces and curry pastes in house and nothing is precooked. I have eaten at Chang Mai Thai, Tum Rup Thai, and Thai Table ( I like the curry here) all in the last few months and Sam is by far my favorite. I liked all of restaurants other than Chang Mai Thai which does Pad Thai well, but I think the rest of the menu is lacking. For me, Sam was the best because it was all about the flavor and they did the tofu correctly. If you are a tofu person, you know how it can be mushy sometimes. Sam gets it right. I bet if you are a meat-a-tarian, you might even like the tofu here. Sam is not a luxury Thai restaurant like the ones in Uptown. You won’t find swanky cocktails or themed decor. But, you will get a TV playing Justin Bieber, a drink machine that says you can only use it for ice, and a magazine collection. It is cozy and homey. I tried a few items while I was there. The first, was a shrimp and chicken spring roll with a peanut sauce. It was very good and I liked the combination with both meats and the sauce. The sauce was not spicy and I could tell that the peanuts were just crushed. Plus, they were huge! See below. With help from Sam, I ordered Pad Woon Sen which he says that many customers like because they are no fat low-carb noodles. He said they were made out of bean and now I know why many people order this, because they were delicious and felt like carbs. I ordered mine with beef and it came with a very flavorful broth. 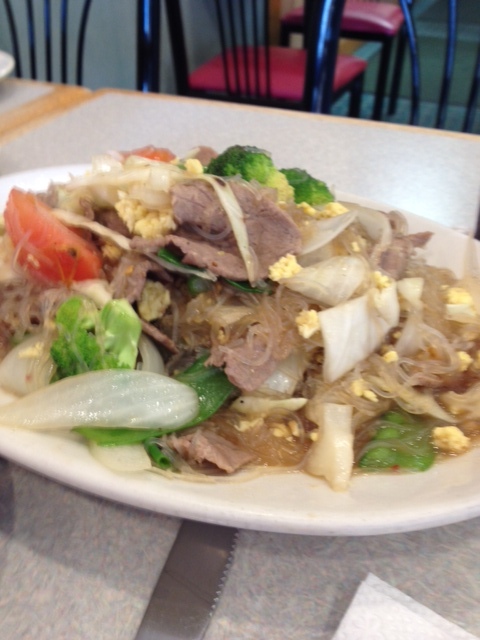 Which it set it apart from all the other items that I have had at other Thai restaurants. See below. I also had a few bites of Pad Thai with tofu, I say only a few bites because it was gone within minutes. The portions are large, so you should have some for the next day if you don’t end up eating it all right away. Overall, this is something that you need to try and make your friends try as well. If you haven’t been here yet, take a day trip or a night trip to White Bear Lake. Have dinner at Sam and check out some of the cute shops in downtown White Bear or go boating on the lake. Because food is always better when passed down through generations. 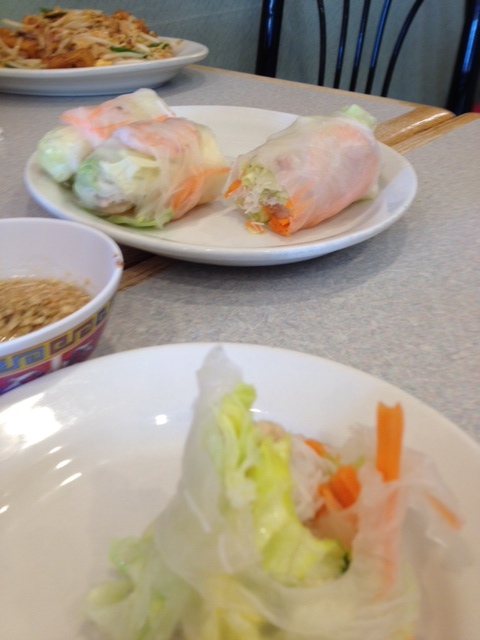 We have a Thai restaurant in Faribault, but I have nothing with which to compare it. I like the food, that’s for sure. I’m always a tad bit jealous of all the unique food choices and venues you have in the metro have. If I liked going into the Cities and had lots of disposal cash, I’d certainly love to sample some of those foods you describe.